It takes a lot to impress the residents of Sandbanks, that magnificent slice of Dorset coastal paradise where multi-million pound homes, impossibly flash cars and designer outfits are de rigueur - they’ve seen it all. But even the locals turned out in their droves for the media launch of this month’s 2010 British Beach Polo Championships. Organiser Johnny Wheeler - the dashing Army officer who established this hugely successful event just three years ago, smiled broadly as he watched Sandbanks regulars jostling alongside the press to watch top international polo player Matias Ballesteros clambering uneasily onto a camel. Camel? Well, you have to ring the changes and this year the addition of camel polo offers just one more intriguing attraction during what has become a prime event in the annual social calendar. Ballesteros, one of a series of big names along for the launch, offered to give it a try for the Press and TV. Initially the beast looked disinterested but obligingly lurched into action, cantering slowly along Sandbanks beach as the Argentinian, in full polo kit and holding mallet aloft, got the measure of his new mount. For a man so at ease on horseback, this was clearly a new and slightly unnerving experience. Safely back on two feet, he diplomatically announced that riding a camel was “different” but “great fun”. Fortunately Ballesteros and other top players like Jamie Morrison and Jack Kidd - big brother of model Jodie - will not be expected to swap their ponies for these displaced ships of the desert during the championships. This of course is why a brace of camels had been shipped to Poole for the benefit of the waiting press. They had been provided by the wonderfully named Joseph’s Amazing Camels, a midlands based company that provides animals for films, TV, racing, exhibitions, publicity stunts and any other camel-related requirements you may have. They arrived with a pair of handlers who surveyed the hapless polo professionals efforts with interest. “It’s lucky we didn’t bring the fast ones,” observed one knowingly. 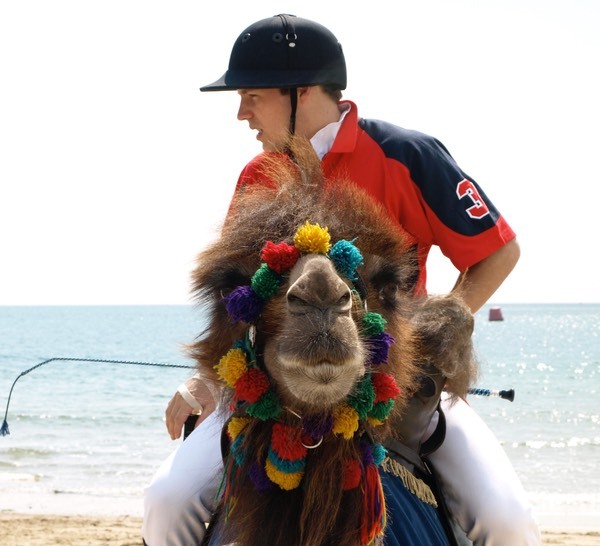 Happily both the camels and riders actually taking part in the championships will be fully trained polo experts. There will also be plenty of other attractions, not least the chance to witness some of the world’s greatest players engaged in two days of fast-paced, adrenaline-fuelled arena polo. In addition there will be displays of beach volley-ball and, for those who prefer slightly less physical pursuits, even fashion shows. Visitors and residents alike will be able to enjoy hard-hitting displays of sportsmanship during the day before partying with the stars at a series of glamorous evening parties. Among the attractions at these celebrity-studded events will be a DJ set from former model, and jewellery designer, Jade Jagger. And when Johnny Wheeler says: “This year it is going to be bigger and better than ever before,” somehow his statement seems to have a resonance beyond the obvious PR spin. He stresses that his interest in presenting polo of the very highest standard is partly aimed at attracting new fans to the sport he loves. He is adamant that despite its desperately elitist image polo is a sport for everyone. As a Lieutenant-Colonel in the Household Cavalry, Johnny knows quite a bit about horses. Ironically he feels that the glamour of Sandbanks beach is exactly the kind of environment that will attract a more egalitarian following. The 23-year-old business student says she would urge anyone to give it a go. Her own introduction to the sport came during the first Sandbanks Championships in 2008. So much of a passion that Harriet even volunteered to take one of the camels for a spin. It was, she told me, quite an experience. “They don’t move in the same way as horses so when I leant forward to try and make it move a bit faster, it just didn’t and I ended up falling across its neck. * The 2010 British Beach Polo Championshipsat Sandbanks runs from Friday July 9 to Sunday July 11 with the main action on the Saturday and Sunday. Part of the money raised by the event will go to local charities including the Royal National Lifeboat Institution (RNLI), Dorset children’s hospice, Julia’s House and the Heaton Ellis Trust for Motor Neurone Disease. Fundraing events will include a race between a polo pony and a Mercedes G Class car. For more information about the Beach Polo Championships visit www.sandpolo.com.